FOR GROUPS IN CASE OF NO SHOW OR REDUCTION IN NUMBER ,CANCELLATION NO REFUND ON THE BOOKING PAYMENT. This is really an ideal accommodation solution for the budget conscious traveller who still wishes to be accommodated centrally in a clean room with a private bathroom. 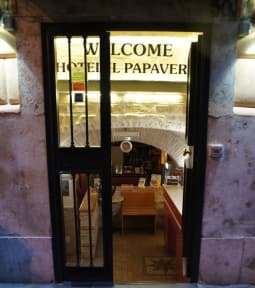 The main hotel is located a few minutes walk from the metro station Repubblica, and also from Termini, but in a quiet street far from the hustle and bustle of Termini's. All our rooms have wi-fi connection. The major points of interest like Colosseum, Spanish Steps, Trevi Fountain,can easily be reached by Metro, Bus or by feet. The payment will be done in CASH at your arrival. The amount does not include the city tax of Rome (€3,00 per person, per night). Cancellation is possible within 72 hours from the arrival day without penalty. The staff were extra ordinary. We got a two bed room and besides the leavers that made noise only when they were leaving; the rest was wonderful I wouldn’t complain about the stairs in Rome. WE LITERALLY WALKED TO COLLOSEO, Maria majore, the castle, Spanish steps , fountain, forum, Palatino hills, and we wanted to try to Vatican walk— I saved that for another trip ALL THESE ATTRACTIONS WERE IN OUR WALKS DISTANCE!!! And walk we did!!! I stayed just one day but I really like there rooms are very good also clean and calm. Lovely, friendly hostel. Room, bathroom, shower and kitchen were spotlessly clean. Common room is comfortable and with enough seating for about 15. There's even a small bar area! A cozy hotel located at a superb location. Very clean and secure. But, good value for money. The value for money is really high. A great place for a quiet retreat in Rome. Comfortable beds, clean bathrooms and a good location about 7-8 min walk from Termini. Clean, next to the station and metro, really good place.. I booked all female dorm and when I check in I got mix dorm, which I don’t like. The wifi in the room work sometime, and don’t work the other time. Yes, there is no heat in the room, I got cold from it.